When inter-family marriages are repeated over and over again, from one generation to the next, when cousins marry cousins and nieces marry uncles, etc, it spells disaster genetically. This was the case of the marriage of Robert of Bourbon-Parma and his first wife, Maria Pia of Bourbon-Sicily. If you examine the tangled family relationships, you'll note that they were VERY closely related and had common ancestors going back MANY generations. Of the twelve children they had, only three were judged to possess normal intelligence: Marie Louise, Elias, and Beatrice. The other nine were definitely retarded and had to be supervised all of their lives. The two elder boys, Joseph and Henry, spent most of their lives under supervision at Villa delle Pianore, the Parma chateau near Viareggio. Prince Elias was made acting Head of the Family under the terms of his father's last will and testament. As noted in a previous listing, Elias became "Duke of Parma" in 1950. He ensured that his retarded siblings received the supervision and care required. 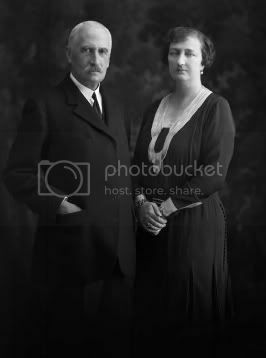 All twelve of the children of Robert and Maria Antoinia, his second wife, were normal, although not particularly good-looking. The best-looking Bourbon-Parma princess from that generation, Maria Antoinia, became a nun. An existing photograph taken prior to her vows shows a stunning young woman. Robert of Bourbon-Parma was an extremely wealthy man. Not only did he inherit a vast fortune from his uncle, the Comte de Chambord, but he was also the heir of his grandfather, Charles II of Parma, who died in the spring of 1883 (Chambord died in the fall of 1883). Charles II (known at the Comte de Villafranca) left his extremely valuable library of religious books to his grandson, for example. Chambord is now a museum and can be visited, of course. Schwarzau is a women's prison and cannot be visited. Pianore is a school but can be visited if arrangements are made beforehand. Wartegg stood abandoned for many years, but has now been turned into a fine hotel. The Bourbon-Parma family, by and large, are buried in the crypt of the Villa Borbone (or Tenuta Reale) just outside Viareggio, Italy---not too far from Pianore. Villa Borbone is now owned by the city, but the adjoining chapel and crypt are owned by Archduke Dominik of Austria, the great-grandson of Princess Marguerite of Bourbon-Parma, Duchesse de Madrid----Robert of Bourbon-Parma's elder sister. I've always been interested in the relationship between Prince Elias and his half-brothers, Xavier and Sixte. I believe there was some discord in the family regarding their father's estate and the distribution of the enormous proceeds from the confiscation of the Chateau de Chambord. Does anyone have any information on this? I find this thread to be particularly fascinating since they were all descendants of that rascal Artois (Charles X). Who would have thought that of his siblings, he and his unhappy wife would have had so many descendants? From all the 8 only Pss. 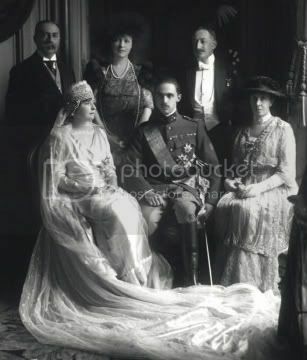 Alice got married (with Infante D.Alfonso, Duke of Calabria) and had descendants. What happened with the others ? Jeanne was shot in a hunting accident in Spain when she was 33 and single. Did it pass to the next generation ? Infanta Alicia appears a lot in spanish magazines and looks quite normal. I've seen a picture of Pss. Maria-Cristina at the wedding of one of her great-nieces and (apart being on a wheel-chair - and she was almost 80 y.old) there seemed nothing wrong with her. 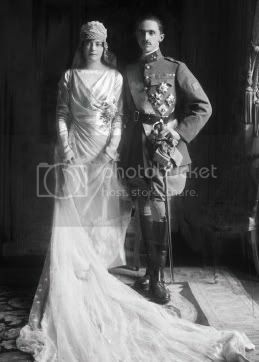 Wedding picture of Prince Sixtus and Princess Hedwig of Bourbon-Parma! 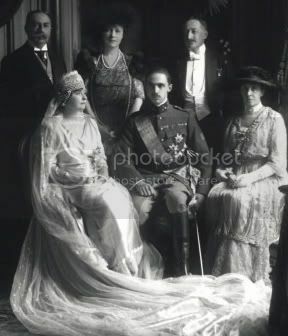 back row: Don Jaime, Duke of Madrid (cousin of Sixte), bride's mother (nee Princess Louise Radziwill), bride's father (Duke of Doudeauville). Is Hedwige wearing the famous Bourbon-Parme tiara that she received for her wedding? It's hard to tell in this photo. Please forgive me, I'm not very up on these families but am very interested in this one. What family is Hedwig from? Hedwig is from the prominent de la Rouchefoucauld family, a French ducal family with numerous branches. Hedwig's father was Armand de la Rochefoucauld, 5th Duke of Doudeauville. Hedwig's family was very rich and she brought a large dowry to the marriage, undoubtedly part of the attraction to Prince Sixte in marrying her, given he was not overly well off himself. Hedwig ultimately inherited the Chateau de Bonnetable, a beautiful castle near Sarthre. There are numerous photos of Bonnetable on the Internet - it's now owned by their daughter Isabelle. Interestingly, Isabelle married a distant de la Rochefoucauld cousin, Roger de la Rochefoucauld of the Estissac branch. In turn one of their sons married yet another de la Rochefoucauld cousin from a different ducal line of the family. Two more pictures of Sixtus and Hedwig! 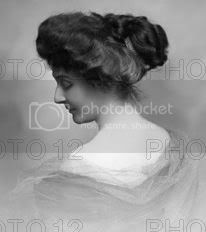 Has anybody got a picture of Prince Sixtus of Bourbon Parma´s wife? Her name was Hedwig and she as born as a Rouchefoucauld, unfortunately I have never seen her picture. Is there a wedding picture of Zitas famous brother Sixtus and her, or something? The couple had one daughter, of whome I don´t know, if she is still alive, because she is over eighty. I think these are well-known pictures. I recognize Duchess D. Maria Antónia sitted next to Sixte. I suppose the couple behind the bride would be her parents. Who is the man standing between Sixte and D. Maria Antónia ? Do you have any photos of the couple's daughter Isabelle ? A few years ago her name was linked to some dubious economic affairs, don't remember exactly what.